Goldman Sachs delivered a rare earnings miss, but the news wasn't all terrible. 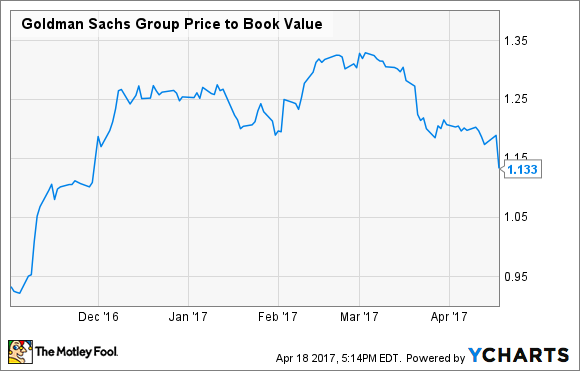 Goldman Sachs (NYSE:GS) has a strong history of beating analysts' expectations. In fact, since it went public nearly 20 years ago, the investment bank has beaten expectations 90% of the time, and it hasn't reported an earnings miss since late 2015. So when Goldman Sachs reported first-quarter earnings that failed to meet expectations, it was quite a surprise to investors. The stock dropped by 5% following the report, and it is now trading at its lowest level since November 2016. While there was a lot of negative information in Goldman Sachs' first-quarter earnings report, the news wasn't all bad. Here's a breakdown of the news, good and bad. To be perfectly clear, this was not a great quarter for Goldman Sachs -- far from it. The company missed expectations on both the top and bottom lines. Revenue came in at $8.026 billion, far short of the $8.446 billion analysts had been expecting. Also, earnings of $5.15 per share failed to match the $5.31 analysts were looking for. In addition, equities trading revenue fell by 6% from the first quarter of last year, which was a major contributor to the earnings and revenue miss. While competitors have reported strong bond trading revenue, Goldman's was flat year over year. Merger and acquisitions volume as a whole has also been weak throughout the first few months of 2017, which was also a factor in the bank's weak performance. Not only does Goldman have a long history of beating expectations, but the rest of the banking sector produced very strong earnings in the quarter, which added to Goldman investors' disappointment. Even though M&A activity has been weak, Goldman Sachs ranked first in announced mergers and acquisitions so far in 2017. The bank also had the number one position in equity and common stock offerings for the year. Investing and lending revenue was the highest it's been in almost four years. Goldman's investment management revenue grew 12% year over year. Compensation and benefits fell by a full percentage point of net revenue from the first quarter of 2016, from 42% to 41%. Despite 27% higher revenue than 2016's first quarter, total expenses grew by just 15%. Goldman also announced an increase in its quarterly dividend, which is rising by $0.10 to $0.75 per share, beginning with the June dividend payment. Not only that, but Goldman's board authorized the repurchase of another 50 million common shares, worth $10.8 billion, or nearly 13% of the current outstanding share count. That's a pretty aggressive return of capital to shareholders. Goldman Sachs is still an incredible institution and not one to bet against over the long run. So perhaps the best news for long-term investors is that the stock now trades at its lowest price-to-book multiple in over four months. Don't get me wrong. As a Goldman Sachs shareholder myself, I'd be lying if I said I wasn't a bit disappointed with the company's first quarter. However, there's nothing about this quarterly report that I find discouraging from a long-term perspective.